When Pope Francis visited Myanmar (Burma) earlier this week, most of the world’s attention was focused on whether he would refer to the nation’s persecution of its Rohingya people. The Pope’s advisors . . . reportedly counselled against the use of the word “Rohingya,” for fear it would set off an anti-Christian backlash across the majority-Buddhist nation. The concerns are real. Christians, who make up about six per cent of the Myanmar’s population, according to a 2014 census, have also been the target of ethnic and religious violence in recent years. A long-running conflict in the northern state of Kachin, where the Christian majority have been seeking independence since the early 1960s, has displaced more than 120,000 people. A report produced last year by the U.S. Commission on International Religious Freedom, an independent bipartisan federal government commission, documented numerous human rights abuses. Some criticized the Pope for not referring to the Rohingya directly, but the government did announce while he was there that there will be a conference on peace with its ethnic minorities in late January. Following are two articles from World Watch Monitor, giving background on some of the Christian minority groups (which have been almost entirely overlooked while the world has been focused on the atrocities committed against the Muslim Rohingya people). Pope Francis met Kachin and Karen people while in Burma. Pope Francis landed in Myanmar November 27 to start his six-day visit to Southeast Asia, raising the hopes of Christians there that he will address the issues they face in the majority-Buddhist nation. 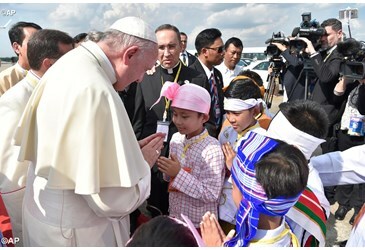 Among those welcoming the Pontiff in Yangon were more than 7,000 ethnic Kachin from the conflict-torn state in northern Myanmar, who had travelled down for the occasion, according to Catholic news agency UCAN. The predominantly Christian Kachin, together with the Karen ethnic minority, live in conflict zones along the country’s borders and have faced years of government oppression. 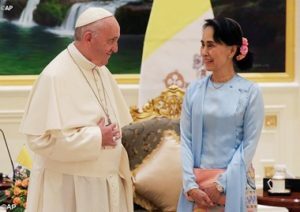 During his three days in Myanmar, the Pope visited the current and former capitals, Nay Pyi Taw and Yangon, and met, among others, the country’s leader – in all but title – Aung San Suu Kyi. The Nobel Prize winner has come under pressure in recent months because of her handling of the Rohingya crisis. Since August more than 600,000 people belonging to the Rohingya Muslim minority have fled into neighbouring Bangladesh following attacks by the army which, according to the UN, amount to “ethnic cleansing”. In October two Kachin Baptist pastors who helped a journalist to photograph a Catholic church, apparently bombed by Myanmar’s army in 2016, were sentenced to two years in prison for their alleged support of the Kachin Independence Army. During a visit to the UK parliament in 2016, Cardinal Bo said: “The majority of the Kachin, Chin . . . and a significant proportion of the Karen, are Christians – and over the decades of armed conflict, the military has turned religion into a tool of oppression. In Karen, Christians have also been threatened by a spate of Buddhist nationalists illegally building pagodas on church grounds. “Christianity is viewed by many as a colonial belief after the country was ruled by the British for a century until its independence in 1948. Likewise, the separation of church and state is considered a foreign imposition,” according to AP journalist Julhas Alam. Around one-sixth of Myanmar’s Christians, who altogether account for around six percent of the population, are Catholics. According to Rev. 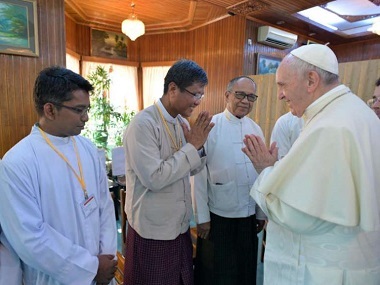 Mariano Soe Naing, a spokesman for Myanmar’s Bishops’ Conference, “there are always challenges to stand up as Catholic and to have strong faith here,” and pressure comes in many different forms. An example is the extremist Buddhist movement called Ma Ba Tha (Committee for the Protection of Race and Religion) which – so far – has mostly targeted Muslim groups in the country through hate speech, but this “has a knock-on effect on Christians as well,” Rogers says. “Ma Ba Tha is not just anti-Muslim, it is Buddhist nationalist, so Christians could come increasingly into its focus,” according to Thomas Muller, analyst for the World Watch Research unit of Christian charity Open Doors. The delayed release of the census by nearly two years was, some commentators said, to avoid a backlash from nationalists anticipating a sharp rise in non-Buddhist religions, which they feel threaten Myanmar’s Buddhist identity. 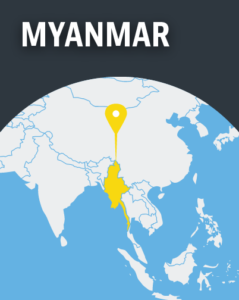 Myanmar is 28th on Open Doors’ 2017 World Watch List of the 50 countries where Christians are most under pressure for their faith. However, during a meeting at the residence of the Catholic Cardinal Charles Bo, the chief of Myanmar’s army, General Min Aung, told Pope Francis that “there is no religious and ethnic discrimination in the country”. By contrast, Cardinal Bo told the UK parliament in 2016 that “the military has turned religion into a tool of oppression”. These article are re-posted by permission from World Watch Monitor. The first was modified very slightly because it was posted November 27, the day the Pope arrived in Myanmar. The second was posted November 29. 1. Good numbers of Karen Christians have immigrated to Metro Vancouver, especially Langley, often after spending a decade or more in refugee camps on the Thai/Myanmar border. Go here and here to read a couple of accounts about their experience. 2. I recently wrote a brief introduction to Greg Toews (Partners Canada) and his work with the Rohingya – and refugees from Myanmar in general. 3. Yasmin Ullah is a young woman who grew up in Rakhine State (home of the Rohingya) and now lives in Metro Vancouver. She is a passionate advocate for her people and is raising funds and support for them. Read something of her story here.